In February 2014, I asked my subscribers for their favorite math puzzle. This collection is the result—a list of puzzles chosen by teachers and parents! Most only require the four basic operations or not even that, so they work well for elementary school children and on up. I have divide the puzzles into ones that are geometric in nature and ones that are math & logic puzzles. The challenging puzzles are on their own page. I also list several good puzzle websites and books at the bottom of this page. This is for you kindergarten folks—a coloring Sudoku game! The stars in the same row and column must have different colors. Move three sticks and make the fish to swim in the opposite direction. You can see the solution and play an interactive version of this puzzle at Puzzles.com (and many others too!). He then found out he need 7 more wall pieces to finish his project. How did he rearrange the pens so that there was only 1 pig per pen? 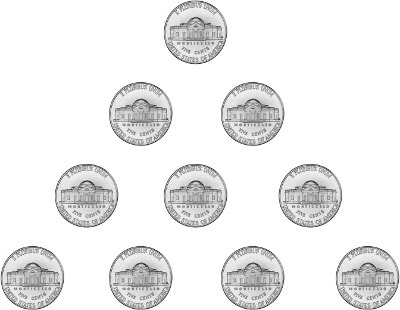 Move only three coins and turn the triangle upside down. Click here for the answer, but not before you've thought about it! This is one of my favorites! It is a simple puzzle, but illustrates beautifully the idea of "thinking outside the box." Join all the dots using four straight lines and without lifting your pencil. Click here for the answer, but think about it first! See a hint and the solution at Cool Math 4 Kids site. Tower of Hanoi is an old favorite puzzle where you move disks from one tower to another. If you've never played, try this online version. You can either play it yourself, or let the computer solve it. A gardener planted 10 trees in five rows. Each row had four trees in it. How did he do this? Click here for the answer, but don't peek too early—give it a good honest try first! 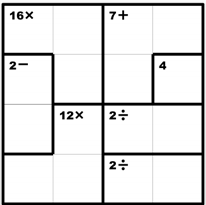 In Kenken, you need to place the counting numbers in the squares just like in Sudoku, but additionally, you are given boxes with clues with math operations. The numbers you place in each box have to make the "clue" number using the given operation. So, Kenken is an excellent game to practice the four operations and logical thinking. Lower elementary children can use addition/subtraction and others can use multiplication/division or all four operations. Play Kenken online here. You can choose the size of the game, operations, and the difficulty level. 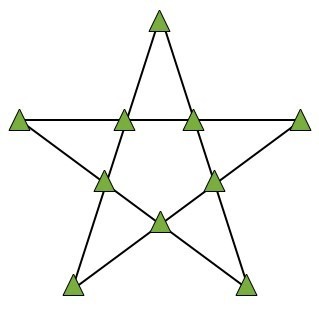 Put the numbers from 1 to 9 in the circles so that the sum of the numbers on each side of a triangle is the same. At CoolMath4Kids you can view a hint and the solution. Kakuro puzzles are "cross-sum" puzzles—like mathematical crossword puzzles. Each "word" must add up to the number provided in the clue above it or to the left. Download 5x5 Kakuro puzzles at KrazyDad. Other sizes exist also. Here is a puzzle that seems simple, but is a good critical thinking challenge for lower elementary school kids. You can easily reword it for example to have two flocks of birds in two trees. Farmer Brown and Farmer Green were ruminating one day on the fence between their farms. Farmer Brown says, "You know I was just thinking. If you gave me one of your cows, then we would have the same number of cows." Farmer Green replies, "If you gave me one of your cows, then I would have twice as many as you!" How many cows does Farmer Brown have and how many cows does Farmer Green have? Farmer Brown has five and Farmer Green has seven cows. This puzzle is from Grace Church School's collection of Abacus problems 2013-2014 for grades 3-8. The site does not supply the answers, but students are encouraged to submit their answers and they will receive a reply. I have more than two animals at home. All of them are dogs, except for two. All of them are cats, except for two. All of them are hamsters, except for two. What kinds of animals and how many of each animal do I have? I have three animals: one dog, one cat, and one hamster. This is well-known problem that sounds so simple, yet it fools many people! A brick weighs one kilogram plus half of the brick. What is the weight of one brick? It weighs 2 kg. Since a brick weighs 1 kg + half of a brick, the 1 kg gives us the weight of the other half of the brick. Since half a brick weighs 1 kg, the brick weighs 2 kg. Many people incorrectly answer 1 1/2 kg. A car is going up a hill. The hill is one mile long. The driver goes up the hill at an average speed of 30 miles per hour. When the driver reaches the top of the hill, he starts down the other side. The downhill side is also one mile long. How fast must the driver go down the hill in order to average 60 miles per hour? It is impossible to average 60 miles per hour. An average speed of 60 miles per hour requires two minutes to cover two miles. The first mile was covered at 30 miles per hour. This means that two minutes were used to travel that mile. Hence there are no minutes left to cover the second mile. 1. There are 7 girls on a bus. 2. Each girl has 7 backpacks. 3. In each backpack, there are 7 big cats. 4. For every big cat there are 7 little cats. How many legs are on the bus, not counting the driver? There are a total of 10,990 legs. There are 7 × 7 × 7 = 343 large cats. They have 343 × 4 = 1372 legs. There are 7 × 7 × 7 × 7 = 2401 little cats. They have 2401 × 4 = 9604 legs. There are 7 girls. They have 14 legs. In total we get 1372 + 9604 + 14 = 10,990 legs. How can these be equal? In which meaning 1070 = 1110 ? 10 hours 70 minutes equals 11 hours 10 minutes. An intelligent trader travels from 1 place to another carrying 3 sacks having 30 coconuts each.No sack can hold more than 30 coconuts. On the way he passes through 30 checkpoints and on each checkpoint he has to give 1 coconut for each sack he is carrying. How many coconuts are left in the end? There are 25 coconuts left. He will give out 3 coconuts at each of the first 10 checkpoints and empty his first bag. He has two sacks left. Then he gives out 2 cocounts at each of the next 15 checkpoints, emptying his second bag. Then he has one bag of coconuts left and only 5 checkpoints to go, which means he gives out 5 coconuts from the last bag and is left with 25 coconuts. A milkman has an 8-liter container full of milk, and also two empty containers that measure 5 liters and 3 liters. He needs to deliver 4 liters of milk to a customer. The milkman has no other spare containers and no way to mark any containers. He does not want to pour milk away. How will he measure the 4 liters of milk? Pour out from the 5-liter container to the 3-liter one until it's full. The 5-liter container now has 2 liters left. Pour all the milk from the 3-liter container back to the 8-liter container. Pour the 2 liters from the 5-liter container to the 3-liter container. It has therefore just one liter of space left! Pour out from the 5-liter container enough milk to fill the 3-liter container (which already has 2 liters). You will have 4 liters left in the 5-liter container. A farmer was asked how many ducks he had. "Well," he said, "they ran down the path just now and I saw one duck in front of two ducks, a duck behind two ducks, and a duck between two ducks." How many ducks were there? There are three ducks, one in front of another. Enter each of the numbers from 1 to 9 in the squares, each one only once. The order of operations doesn't apply! These puzzles are available in four different levels of difficulty. You can download a printable jigsaw puzzle to practice equivalent fractions, decimals, and percents, published here by permission from the creator Becky Colvin. You need to cut it out first. We fold a piece of paper, 1/10 mm thick, in a way as if we were to try and fit it in a little pocket: in half, in half again, in half once more, and so on. Let's assume that in our minds (because in reality it's impossible – try it yourself!) we have folded our piece of paper 50 times. How thick will such a folded paper be? If you don't want to calculate, at least make an educated guess! It is 1/10 × 250 mm thick. Converted to kilometers, we get that the thickness is (1/10) × 250 × (1/1000000) km = 112,589,991 km thick. Those who do not know this problem usually assume that the stack will not be thicker than up to a couple of meters. However, the thickness of a piece of paper folded in half 50 times will be surprisingly big, more than 112 million kilometers! (The distance from the Earth to the Sun is about 150,000,000 km). The list above already has many links to websites with puzzles, but here are some more. Challenging puzzles sent to my puzzle contest. Our whole family enjoys this book! It is divided into 14 chapters, each with different kinds of puzzles, such as matchstick puzzles, dominoes and dice, divisibility, cross sums and magic squares, "Measure Seven Times Before You Cut" (dissection puzzles), "With Algebra and without It" (tricky word problems), and so on. The puzzles and brainteasers range from simple fun riddles to difficult problems, yet none requiring advanced math. They are almost always illustrated and often presented as amusing stories. The book was originally published in Russia in 1956. 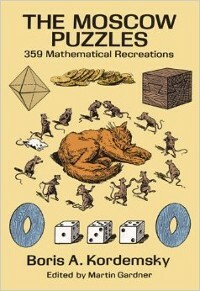 Martin Gardner has edited the book to make it as easy as possible for an English-reading public to understand, while carefully retaining nearly all the warmth and humor of the original. Price: About $5 used, about $9 new. Fun and lively daily math problems centered around real-life topics and offered in three levels: Wee Ones, Little Kids, and Big Kids. You can also get Bedtime Math problems in a free app. These are "number pyramids" where you get each number by adding the numbers just below it. Puzzles increase in difficulty so that grade 4 puzzles use negative numbers and grade 5 puzzles use decimals. Twelve printable (PDF) puzzles for the whole family. 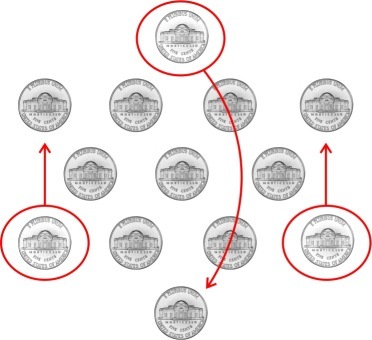 Most are visual kind of puzzles where you rearrange pennies and sticks into another shape. A children's magazine that is packed full of puzzles, mazes and teasers specially created to appeal to kids ages 7 and up. A large collection of puzzles where you need to rearrange matches. You draw a snake (or a path) on a 5x5 grid from the lower left square to the upper right square. The grid has some chess pieces, and each piece attacks the same number of segments of the snake. About two dozen printable puzzles (PDF) for upper elementary children. Fun riddles based on math concepts.